2003. Edited by George Plimpton. 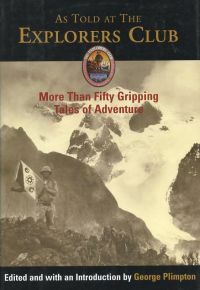 A very nice used copy of this fascinating collection of more than fifty tales of adventure and exploration from around the globe. Book was publsihed in celebration of the 100th aniversary of the formation of the New York-based Explorers Club. Among the writers/adventurers appearing in this anthiology are Lowell Thomas, L. Ron Hubbard, Roald Amundsen, and Charles A. Lindbergh. Hardcover, with a litghtly owrn dust jacket. 445 pp.